Godaddy is world’s #1 domain name registrar company. I am using their service for last three year. Moreover, also recommend for you. They offer domain name registration service at a meager price. If you are a new customer, you can register a new domain name in just Rs.99 or $0.99 for the first year and Rs.1000 or $10 for the next every year. Before resisting domain, there are some key thing keep them in mind and follow them. Type your desired domain in the search bar and hit enter or click on search to check availability. If it is not available, try a different with some changes. When you find an available domain click on add to cart button. By default, GoDaddy includes some other product like web hosting, registration privacy removes all of them and click on continue to cart button. Finally, you will be redirected proceed to the checkout page to place your order click on continue to checkout button. Log in to your account. Moreover, if you are a new customer then click on create an account provide your information and sign up your account. Now it is time to pay charges to your registrar of registration fees. Registration changes depend upon period which you select. I am registering for one year you can choose two or more according to your budget. In Pakistan, you can pay only with a debit or credit card, but in some other countries like USA and India, you can pay with your bank account directly. I am in Pakistan. Therefore, I will pay with my Debit VISA card that is issued me by my bank service provider. A billing address is required please provide your real home address. Type you 16 digit card number, security code, and card holder name and click on the place you order and wait for a few seconds to complete payment processing. A confirmation message will appear, thank you. Okay, you have successfully learned how to register a domain name with GoDaddy. Soon as quickly I will publish a post how to add the custom domain in blogger blog. Please share this post with your friends and other if you feel it is helpful. When you received Payoneer Master Card, you need to activate it first to use it. Do you want to know how to enable it? There is a quick tutorial about this matter. You may not be eligible for receive, withdraw payments or shopping online with this until you did not activate it. After completing the sign-up process, Payoneer sends a card to your shipping address. They also mention estimated arriving date in your account. Typically it takes 20-25 days.When you collect your Payoneer Master Card, it will cover under an envelope. Open it and read all instructions carefully. Here is a sixteen digit code on the card. You will use this number for activation purpose. There are three ways to activate your card first one by login to your account. Second, install the Payoneer app on Smartphone and then scan QR code that came with your parcel. This app is available for both modern operating system Android and iOS. You can download this app from Google Play Store and Apple App Store free of cost. Thirdly, by a call on numbers that are placed on the instruction page. Here I am activating mine card using web means by login into my Payoneer account follow me. It is an easy, fast and free method. First of all, go to myaccount.payoneer.com type your email address and password and login to your account. You will see an orange color button Activate click on this button if you could not found this option. 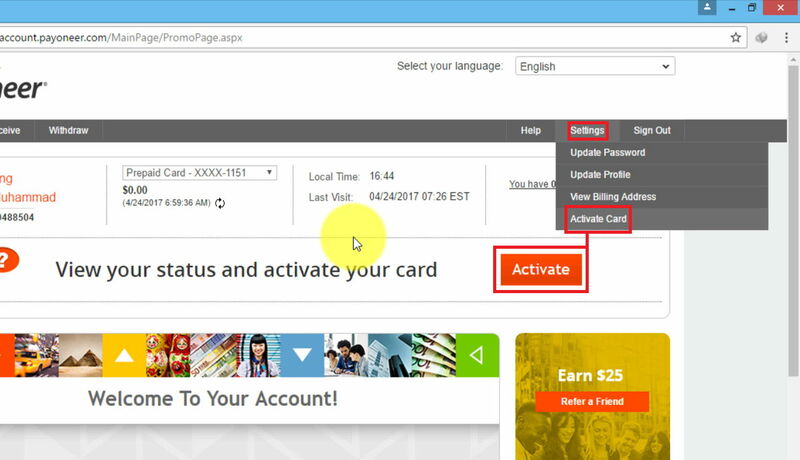 Move your cursor toward Setting at the end of the drop-down menu click on Activate card. It will redirect you to activation page like this snapshot. In the first box enter 16 digit card numbers. In other two boxes type a four digit PIN code make sure you have entered same PIN code in both fields. You will require this PIN code to withdraw your payments with ATM. I advise you to choose a pin code which is easy to remember for you and difficult to guess for others. Finally, click on Activate. 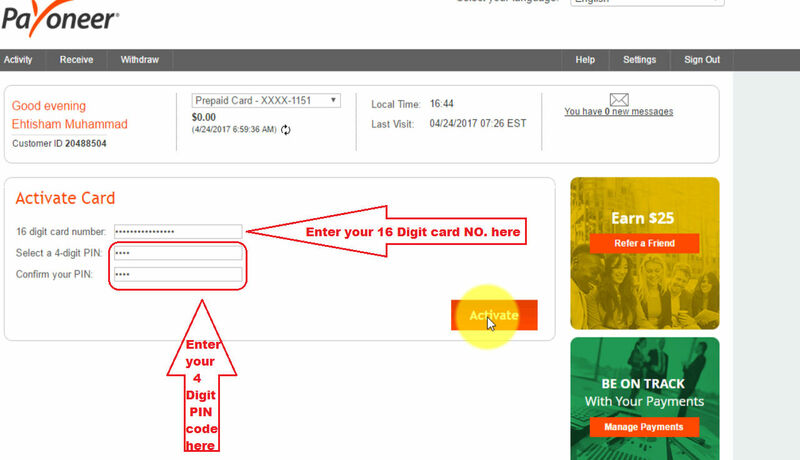 A confirmation message will appear “Your card has been activated successfully.” Keep in mind your Payoneer Master Card is prepaid means you need to load it first with funds before its uses. If the order did not arrive by estimated date, please wait a bit more. Make sure during signing up you have provided a postal address where the Mail came easily. Later connect to Payoneer Support Team share your issue with them. They will issue a new card, and you will receive it as soon as possible. Secondly, never try to insert your card in ATMs machines if it has no balance. Because due to security reasons some ATMs machine may grab your card if it has zero balance.